Last year at this time my life was in a severe upheaval. Since my husband and I had lost our jobs nearly a year earlier, we’d moved twice (locally) and started new jobs. Though we felt more appreciated than at our former employers, the work didn’t pay nearly as well, and the work and commuting demands were taking their toll on us both. Our living situation wasn’t horrible, but it wasn’t ideal either and we honestly didn’t like the little town we had ended up in. After nearly five years in California (having relocated from Idaho at the end of 2011), my husband was certain he heard God’s call for us to return to Idaho. He had a job offer that, and though it didn’t pay much more, it would be sufficient for bare-minimum Idaho living. Not to mention our oldest daughter was in Idaho and a newlywed. The possibility of grand babies was on the horizon and he knew I wouldn’t last long as a long-distant grandma when the time came. Even though we’d be scraping by, I wouldn’t need to work away from home, since I’d be transferring my current job into a freelance gig with reduced hours. I know there are plenty of writers out there who work full-time and write books and have families. During the time we were in California I managed to write two, almost three books, while working full-time. But our family dynamics are different than most people. 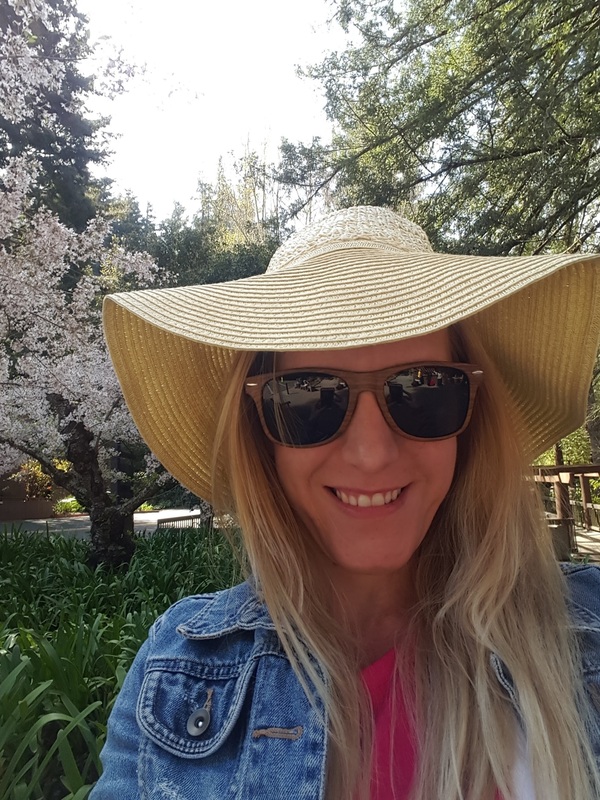 I have chronic health issues (pain, fatigue, and depression) that make it very difficult to keep going day in and day out, week after week, month after month – without my health suffering. In this state of mind and in a constant state of pain, it’s really hard to get creative and focus on writing. Top that off with uncertainty about our living situation, how pay our bills or feed our family week after week and I think you get the picture. Even if I felt inspired to write, I felt guilty about doing so since the needs of my family were not being met. Yet, on the brink of moving back to Idaho there was one thing I had not yet done since moving to California. And that was attending the Mount Hermon Christian Writers’ Conference. I had heard of it during my first weeks of becoming a member of the Inspire Christian Writer’s group in Roseville. But for one reason or another, it had not worked out. So, I asked my husband for his blessing. If I could save from my own income, and get a scholarship, could I stay an extra two weeks and attend the conference before joining him and our boys in Idaho? We would have to move out completely from our current rental, and I would need to stay with my mom, who conveniently lived in Northern California 10 minutes away from my job versus the 30 minutes drive from our house, and about an hour closer to Mount Hermon. It was hard to explain it to him, but I also felt that this transition time would help release some of the stress that had been building over recent months. And it would help me to focus on writing again. Of course, I would miss him and our three boys, but I would be only taking care of my own needs, getting myself to work, and have down time each evening with my mom and my adult daughter who was living with her at the time. Honestly, a year later a lot of the details are a blur. I remember having a really bad migraine the day before the conference. I had a final doctor appointment already scheduled, but he prescribed me something different, which in turn made me sick halfway into the night. Somehow, I got a few hours of sleep, woke up early, and started the drive to Santa Cruz with my crossover packed full of everything that wouldn’t fit into the moving truck. I had my song list ready to play, and I was determined to worship the Lord the entire way. I didn’t know why he allowed me to get sick the day before the conference. But I knew he had something for me there. Because of how exhausted I was, and my lack of appetite from the medicine side-effects, I was in a fully frail state when I arrived. 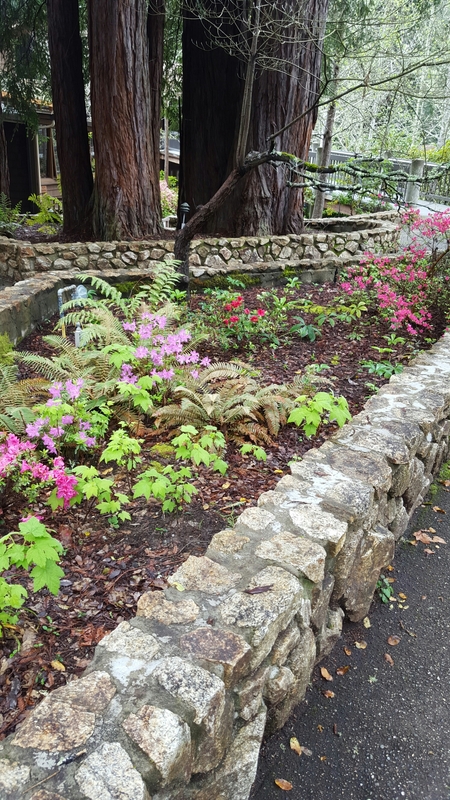 A tad backstory here – I was born in Santa Cruz. I hadn’t live there very much of my childhood, but I ended up living there a few years as a teenager after my parents divorced. One of my favorite past times was walking through the woods up in the mountains off of Summit Road, making up stories in my mind. Back then I didn’t realize what drew me to those mountains. There was something magical about the trees hovering high above, the scent of dirt and petals and various animals emanating from the sunlight that streamed through branches and breaks in the forest. The mixture of cool earth and shadows with glimmers of warmth and light. 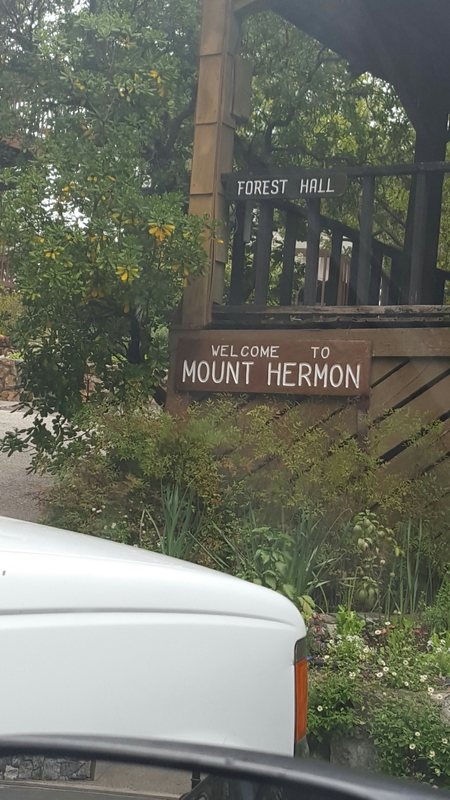 When I drove into the entrance at Mount Hermon, it all came back to me. One of the first books I ever started writing, happened in these mountains. These mountains were where I was first inspired to become a writer at the tender age of 11, and mostly at that time as a means to process the pains and confusion of my parents’ divorce. It was a blend of the old and the new. I eventually found my cabin and settled in. My roommate wasn’t there yet so I took advantage of being alone and just rested my heart, my mind, my soul, and my body. I wrote in my journal, read through the conference packet, and prayed for God to connect me with those who I needed to be connected with, to allowed me to be honest and to accept whatever words of advice and wisdom I received from those I met during the week. A little note about that scripture verse at the top of this post – Isaiah 43:18-19. When we’d first moved back to California in 2011, God had given me that verse as a promise. And I’d held onto it for nearly five years, waiting to experience the fulfillment of those words. 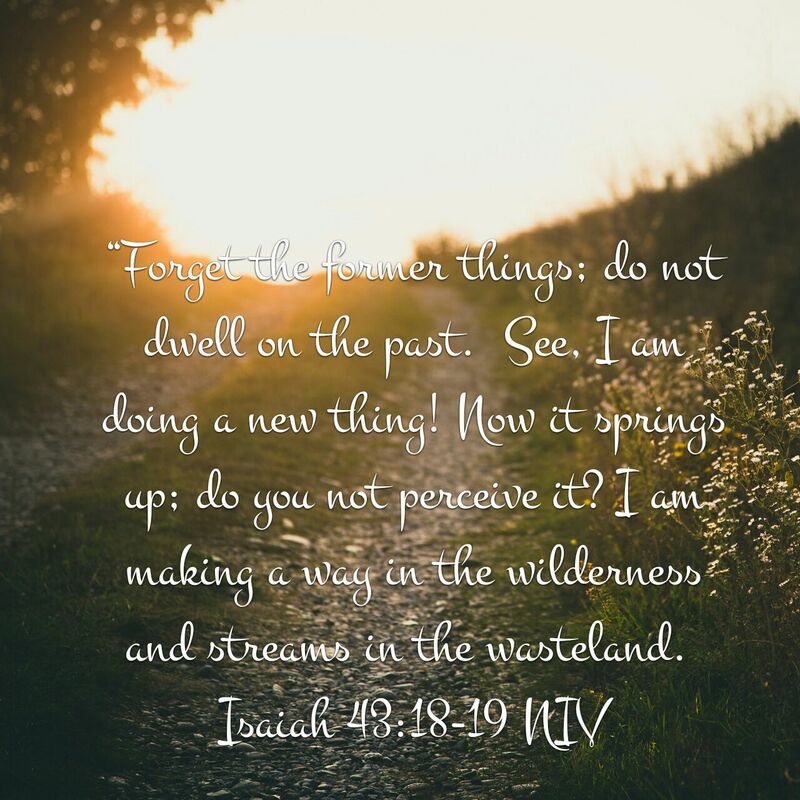 So when Mona Hodgson quoted those exact words in the introductory session, I knew without a doubt that God was telling me my new life, that “New Thing” was springing up in that moment. In all the radio broadcasts, Bible studies, and church events I’d sat through, this was the first time anyone had spoken those words since God had back in 2011. And that’s when the tears came, a different type of tears than I think I’d ever cried before. They weren’t the tears of frustration, anger, or discouragement that had flooded from my eyes numerous times in the months prior. They were tears of cleansing and refreshment and knowing that the palms of my Heavenly Father were beneath me, holding me securely in His plans to prosper and not harm. The first couple of days were brutal. I cried a lot… A lot! If anyone remembers me from last year, they probably remember that I cried the first couple days. I cried during the General Sessions. I cried at meal time. And I cried in between the workshops. But it was during these times that I ended up meeting some of the most wonderful people. Marcy and Angela became my surrogates. They told me their stories as struggling writers, mothers, and wives. And they kept checking on me through the week. I didn’t feel alone and I didn’t feel like a stranger. There are others as well, but these two stick out to me the most. I’m really hoping that they will be there this year. I’m looking forward to sharing what a crazy time 2016 was, but how God brought me back to experience Mount Hermon in a whole new way. I wish I could say that I’ve been writing like crazy since the last time I attended. But that’s not the case. I finished and submitted my second book in the No Eye Has Seen Series, but I didn’t do enough marketing of the first one, so I’m in a stand still when it comes to that story. It’s tentatively set to publish in June, so I really won’t know how that turns out until later this year. 2016 was more about getting to a place of stability and health, so that I could really focus on writing without having survival at the helm. So, with what I hope is a more permanent living situation, plenty of income to cover our needs and some wants, and for the very first time ever… drum roll please… a writing office that has a door! – I am preparing for my return to Mount Hermon. I have an entirely new story that I’ve started, not finished, but that’s okay. I’m not in a rush at this point. I believe my story premise is solid, and I’m fairly sure I’ve got the basics of my writing technique and style down, though I know there’s always room for improvement. What I’m looking for is honest critique and one-on-one instruction so that I can take the beginnings of this WIP and be confident I’m on the right track as I work toward completing it through the remainder of this year. I’ll be attending the pre-conference and the morning mentoring sessions to reach my goal. However, I might be looking forward more to relationship building than I am to building my story. But either way, I know I will get a lot out of the Mount Hermon conference this year. Since I know a little of what to expect this time, I’m sure I will feel more relaxed and comfortable. For any first-timers out there, feel free to come say hi, get a hug, and share with me if you feel the need. I’m happy to pay forward the love, understanding, and encouragement I received last year. As a final note, I am a grandma now! 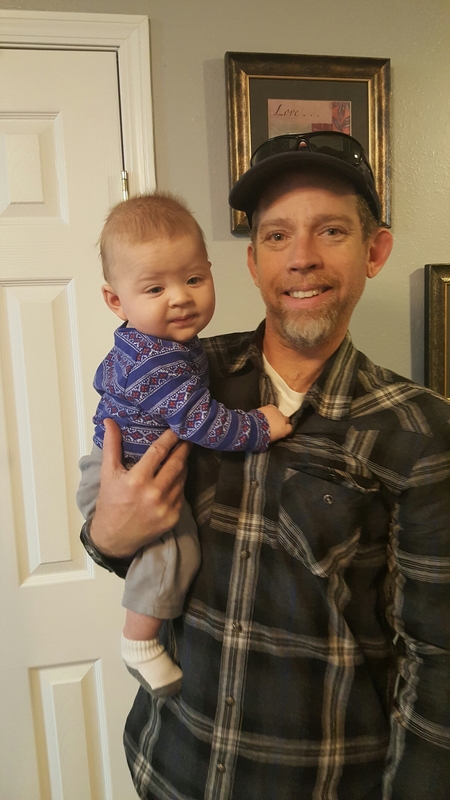 My grandson, Kadyn, is an adorable, happy baby and will be almost 7 months old in April. My latest Grammy pic is always on my phone in case you want a glimpse at his cuteness!